BrownJELO: This is not good. In our house there are very few places where you can put things to keep them safe. I will put things on top of the entertainment center and on top of the piano but I really try hard not to do this because I also hate it when stuff gets cluttered in these places. The dining room table is not considered safe because 1. Owen can get into it and 2. it will likely get spilled on. Ya. This is not good. He is super proud of this. I think he feels like he fits in with Ethan and Luke who are always sitting up there together. Not only do I fear for the things that I'm trying to keep safe up there..but I fear for Owen. I have now witnessed him get up onto these stools many times...but have yet to see him try to get down on his own (because I always rescue him before hand). 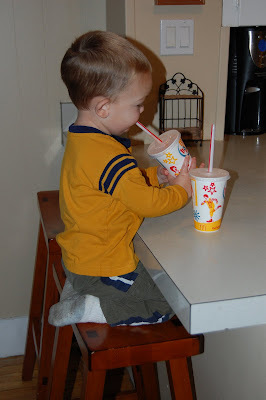 I can picture it now though...It will likely go down like this..
Owen scoots off the seat and thinks his feet are going to hit the floor but instead he hits his chin on the counter while he falls and his feet slip under the stool and his hands grab the top of the stool so that both he and the stool fall backwards resulting in Owen hitting the back of his head on the floor and then the stool landing on his forehead. I will be sure to post pics of his bumps after this occasion. 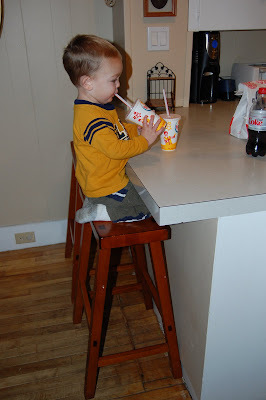 In the meantime, I took a few pics of him sitting up there sipping away on Ethan and Luke's 'soda' and had to laugh. 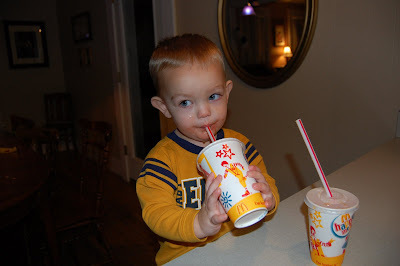 Notice that in each of the following pictures he is drinking a different soda. It was like he hit the jackpot...or was some sort of addict that found a stash. 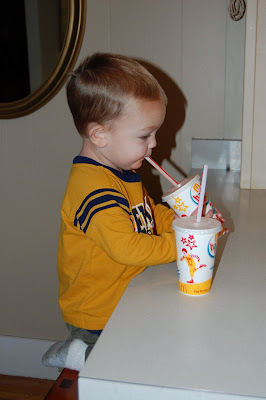 He was going from one to the other..taking swig after swig as fast as possible knowing that I was going to put an end to it very soon. It's all over!!! He is looking so big now!!! Well at least he waited a lot longer than Luke to figure this out!